It’s difficult to remember a time in our country’s political history when almost half of it, 48% of it, awoke to such sombre life-changing news. 75% of this 48% were young people aged 18-24 who voted to remain in the EU; they will live with the consequences of the result for longest. The other half, the 52%, awoke jubilantly as their decision to leave the EU rang out across the internet, TV channels, radio stations and in conversations across garden fences where overwhelming majorities had voted to leave. The highest proportion of those voting leave were aged 65+. In 30 areas with the most elderly people analysed by the BBC, 28 voted to leave; in the 30 areas with fewest graduates, 28 also voted to leave as age, education and British identity proved to be the key factors in voter decision. Whatever the differences, both sides awoke to a divided kingdom, a future of uncertainty and the resignation of our Prime Minister. As David Cameron resigned, the UK reflects on the legacy he’s left. Instead of dealing with the Euroscepticism in his own party, he recklessly gambled our future, leaving a hugely complex decision in the hands of a bewildered general public. Very few of us - on boths sides - felt qualified to decide on something this important; searches for ‘what is the EU?’ peaked on google trends the day after we had all cast our votes. The post-vote analysis shows those living in areas of high social and economic deprivation also predominantly voted to leave the EU - those hardest hit by Cameron’s tenure as PM. Spend just one day in these communities and you will see long queues at foodbanks mirroring those at the job centre as people struggle to survive on zero-hour contracts, cuts in benefits and a lack of help from those who are meant to listen. Even the libraries and community centres - long-time staples for help and advice on benefits and education - are gone. The fact so many communities like this across the UK voted to leave on Thursday is something all the political parties and our society at large must address. “If you’re poor you vote out” one voter said to the Guardian this week, in an election that has become, at least in part about a protest vote where communities vented their anger against the man who forgot them. But they’ve also been forgotten by Labour too who missed a game-changing opportunity to seize back working-class voters. Their campaign was spoken in low tones instead of deafening, rousing volumes. The passionate Sadiq Khan is the obvious exception – just look at what he achieved some of its poorest areas of London when compared to his colleagues. Labour is failing to reach the working classes on the street; the language of the trade unions – a once fiercely powerful voice in Labour that reached so many – is now a distant echo. Labour’s abandonment of its roots has cost it, and the country, dearly. The campaign itself was surely one of the bleakest in memory. The Leave side circulated and preyed on working class communities like sharks. First they scared, then they seized and hurt using some of the most brutal language we’ve ever seen during a political campaign. The lies were spectacular too. Alistair Campbell wrote on Twitter this morning that “EU law allows customers to withdraw from a contract if contract is based on lies. Leave agenda riddled with them. Lawyers on the case.” A petition, calling for a second EU Referendum, is based on triggering this law but whilst many hope, it’s difficult to see it as nothing other than a futile, late attempt to do something. However, the petition for a second referendum now has over 2.5 million signatures and counting. The 65+ generation, those most in need of the NHS, were spun a fairy tale of hope. If we leave Europe, our NHS will be fully funded and thriving once again, they said. 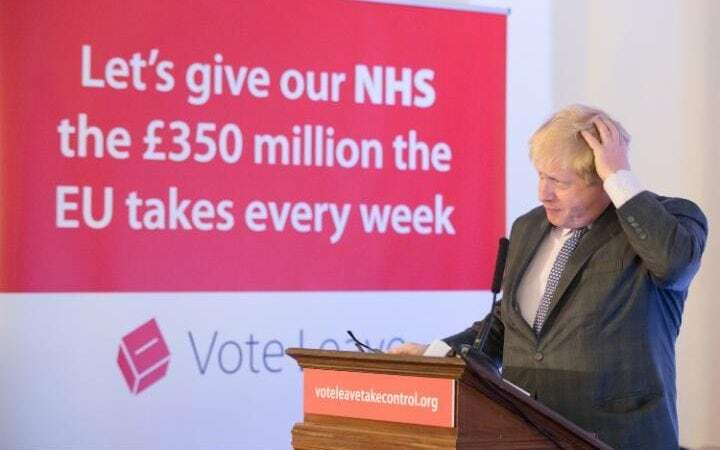 Yet yesterday morning, the key claim that they would have £350 million for the NHS was almost immediately in doubt by those who shouted it most loudly. Nigel Farage disowned the pledge entirely saying it was a “mistake of the leave campaign” despite claiming so himself. It was also laser printed into the side of a campaign bus and emblazoned on just about every poster Boris ever stood in front of. It will be interesting to see his personal response on this claim. And then there has been the ugly language on immigration in which the newspapers became one of the main facilitation tools of the real Project Fear. The Leave campaign have scared communities through nightmare tales of “lorry load of migrants” or th posters with “BREAKING POINT” screaming at them in capital letters as migrants flood a country (not even ours, it turns out). The language of “them and us”, of dehumanisation - of the migrant as alien, someone to be feared and someone as “other”, to quote Edward Said, had entered mainstream political discourse. The further right Leave campaigners seized on this, noting how worked up and frenzied people became over immigration. The communities found their scapegoat and someone to blame. The language of the Leave campaign was heavily criticised as a discourse of hate, slowly seeping into the everyday language. The language of Brexiteers, promising the earth by “taking back control” of “our” borders, became their rhetoric too. How did it get to this? One man interviewed on Channel Four said the EU debate was “all about immigration. It’s not all about trade or Europe or anything like that, it’s all about immigration,” he said. His vote to leave was to “stop the Muslims from coming into this country. Simple as that.” Another interviewee on a different channel said, “they’re taking all our jobs”; footage was shown of people shouting “get back home” to anyone who wasn’t of white British origin. Yesterday, the Brexit Tory MEP Daniel Hannan backtracked on claims that leaving the EU would stop the movement of free labour. Others followed, talking down their hopes of being able to limit immigration despite putting it at the centre of their campaign. So here’s the great irony. Many communities who voted for this in protest will be the hardest hit. Another recession will cripple and without the EU law protecting workers, the Tories will seize on the opportunity for more austerity. In Cameron’s place will be Conservatives like Boris Johnson or Michael Gove. They have woefully undermined democracy by telling them they are voting for something which is the very actual opposite of what they are voting for. None of the Leave campaign seem to have a clue what post-EU Britain will look like. Their lack of a plan is quite terrifying. We are left facing a new level of unprecedented uncertainty. Our country is divided into two and xenophobic language is poisoning the split further. “We’ve won this without a bullet being fired,” said Farage crassly yesterday, a week after MP Jo Cox was murdered by a man shouting “Britain first”. The divisions and hate run deep thanks to the language of this campaign and all parties must work together quickly to heal the divisions. All parties must work together to destroy the myths around immigration or our society will simply never heal. As Scotland look likely to break away from the UK soon, the very essence of what it means to be British is changing too. Whilst the 48% who voted for this feel they want nothing to do with a Britain that votes for Farage, we may even see a British diaspora as people emigrate from a country with which they can no longer identify - applications for Irish passports have surged. There is our international identity too; we are the laughing stock of the world. They warned us fiercely against leaving and see Brexit as an act of suicide. We must now retain a level of calm and reflection as we see what our political leaders do next. They need to repair their broken relationships with the working classes and stop the falsehoods. Until they repair the damage to our working class communities, they will drift further and further into isolation. The older generations too need to communicate with the young who feel so cruelly betrayed. In voting to leave, economic prospects of 18-24 year olds perhaps look the worst of all. As university EU funding dries up, so too do their university places as fees inevitably become higher. As the economy heads into what many are predicting to be an inevitable recession, their chances of ever earning the same as their grandparents decreases as does their chance of owning their own home. Without an NHS, pension or working rights too, the cost to them may be highest of all. It is bewildering that the country has chosen a path that isolates us from dialogue with neighbours - a dialogue which has seen so many incredible achievements in the arts, medicine and science. Are we now the nation that turns away when we see horrifying picture of children drowning whilst trying to escape worn-torn homelands? How do we get the older generations understanding why 75% of the young wanted to stay? How do we improve the life chances of the working classes now we have no EU working laws to protect them? As we enter this strange new world we can only hope that we have a strength of leadership and community to bring our nation back together. Billy Bragg perhaps best summed it up this weekend when he said, “If we believe in democracy, we must accept the result of the EU referendum and work to ameliorate the social and economic effect of Brexit.” Whilst there’s nothing we can do to change the result, all sides must now work together to cope with the vast changes ahead and the inevitable economic and social fall out it will bring.